He sweated out a primary victory and then won by an easy margin on election day. Now comes the real work. Regardless of whether the votes fell for John Creuzot or Faith Johnson, Dallas County’s next elected district attorney was going to lead a much different office than the one they started in. 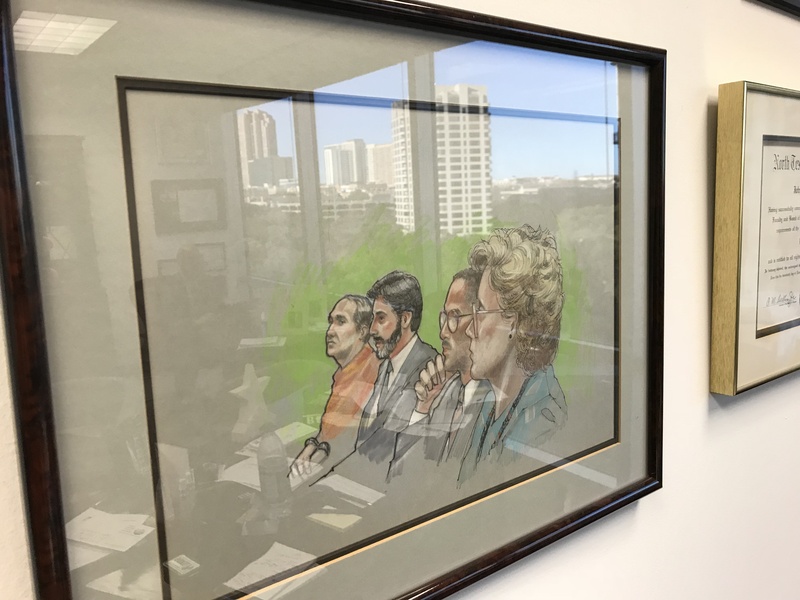 Both candidates began their careers in 1982, as Dallas County prosecutors during Henry Wade’s notoriously aggressive, 36-year run as district attorney. Yet their battle for the powerful perch atop the county’s justice system came amid a wave of reforms prioritizing “smart on crime” over the time-tested “tough on crime,” changes that are mindful of repairing the damage inflicted by the justice of Wade and other DAs of his era. Reformers want to see a marked reversal in the prison system’s decades of bloat, which disproportionately impacted people of color, and which continued long after Wade left office in 1987. More and more people were sent to jail with every passing year—Texas’ 1978 incarceration rate sat at 182 per 100,000 Texans but rocketed to 710 per 100,000 by 2003. It spiked over 1,000 for a time, but today sits at 891. It was Creuzot, the Democrat who eked out a win in the primary without support from national reformers, who won Dallas County. He promised to reduce state jail and prison admissions by 15 to 20 percent within four years. He pumped his well-earned reputation as Texas’ grandaddy of the drug courts, which have reduced recidivism. He leaned on a couple decades of experience with media attention, a lot of it flattering. And after all the ballots were counted, he had won a resounding 60 percent of the vote over the incumbent Republican Johnson. A few local reporters and talking heads had signaled it would be more competitive. Jason Whitely, who hosts WFAA’s Inside Texas Politics, was one of them. The show had featured each candidate. They told viewers to settle in for a tight one. But the early numbers came in lopsided, and Whitely received a text: “Not sure it’s going to be a long night!” wrote Creuzot. The week after election night, with my eyes searching the glistening Oak Lawn buildings for the right address, the guy I was after appeared on the sidewalk, walking toward me in a dark suit and Men in Black-ish sunglasses. He was still riding high. I asked him to tell me about his background. If only briefly, let’s: born in New Orleans, John Creuzot moved to Houston with his family at the age of nine. His father, Percy Creuzot, started Frenchy’s Chicken, a creole fried chicken chain that today boasts some 45 locations and Beyoncé’s stamp of approval. John Creuzot went to the University of North Texas when it was still North Texas State—“make sure to put North Texas State!”—and then traveled around Europe on his own, riding the Eurail and hitch-hiking. He came back to attend law school. Creuzot attended SMU’s Dedman School of Law, graduated in 1982, and went to work for Wade. He was single and hungry to succeed, with the drive to track people down. “There wasn’t anybody I couldn’t find,” he says. If he knew a witness was going to be somewhere, even at 1 a.m., he’d go. It was his role in the famous Randall Dale Adams case—the subject of Errol Morris’ documentary Thin Blue Line—that caused Creuzot to rethink his position at the DA’s office and to consider the bigger picture. Adams had been put away in 1976 for the murder of a Dallas police officer. In 1988, after the movie flung the case back into the public sphere and onto the desk of new DA John Vance, Creuzot was one of a couple prosecutors tasked with the re-examination. He came to believe Adams was innocent. He also came to believe that Vance’s handling of it was less than ethical. After Adams was released, the assistant district attorney who’d tried to keep him in jail was fired. And, in news reported as high up as the New York Times, Creuzot and another assistant left Vance’s office on their own volition. Creuzot flicked his cigarette, and we walked down the sidewalk toward his office building. Inside the lounge, he filled a coffee, ironically not far from a couple of paintings of elephants, one in a red blazer and the other formed from a red carnival balloon. They are, he says, decorations put there by the floor’s management—a floor filled with lots of offices of lots of different professionals from various industries. Over the course of our discussion in his office, Creuzot touched on politics, the role of national reformers in his campaign, his success in creating Dallas County’s DIVERT Court—an acronym for Diversion and Expedited Rehabilitation and Treatment—in 1998 (Gov. Rick Perry leaned on his accomplishments to spur drug courts across the state), and on the high-profile Botham Shem Jean case he will soon take over. 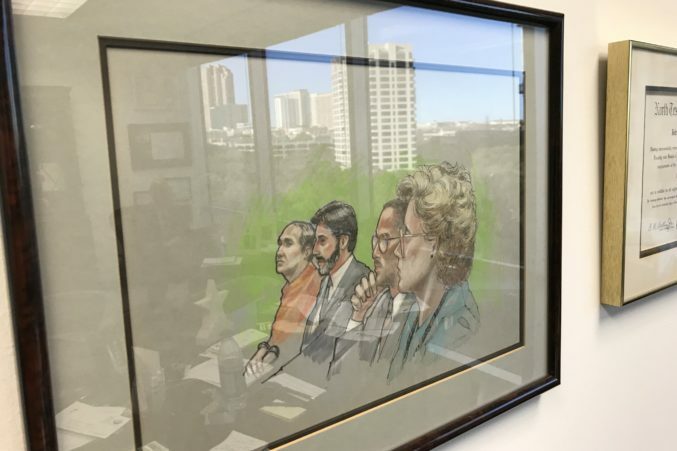 Randall Dale Adams (left) with a team including John Creuzot (second from right) in a courtroom sketch framed in Creuzot’s office. The wave of DAs being elected right now are running on the opposite approach of the time period in which you started, which is that you have to be tough on crime and put people away at all costs. There have been two different eras of criminal justice reform since I’ve been a lawyer, and that was the first one. Build more prisons. Lock up more people. Make the community safe. We went from 50,000 prison beds to 150,000 and the crime rate didn’t really change, it was still going up. I decided to start the DIVERT Court to change the trajectory of what we were doing. When we started nationally talking about people who were cycling in and out of prisons, I started another program simultaneously. You don’t want to mix high-risk people with low-risk people, and the DIVERT Court people were first-time offenders. This other program was designed for people who had been in and out of the penitentiary. Just in and out, in and out, in and out. They had some of the same underlying problems, just more complex. They probably had a terrible childhood. The question is, are you going to keep putting them back in? They get out, they do the same thing, and nobody ever does anything to address the underlying issues. We put them through treatment. We treated them just like we did the others. We had a 31 percent reduction in re-arrests and we had a 67 percent reduction in probation revocations. You played a role statewide, as well. In 2005, the Legislative Budget Board, which is an entity of the state, realized the projections that we would need 17,000 more prison beds. We had gone from 50,000 to 150,000, and now we were talking 167,000. So the leadership—I say the leadership, I’m talking Rick Perry—they decided that we’re not going to do this, this is just crazy. We had something that was measured and was doing well and showed a lot of promise. They started providing more funding for treatment and assessments on regular court dockets in addition to providing structure for more programs. That’s when you got DWI courts, that’s when you got veterans courts. Specialty courts, we started calling them. And what we’ve done now is closed eight prisons. That’s all as a judge, and now you take on this new role. One of the things you’ve set as a goal is a reduction of 15 to 20 percent in state prison and jail admissions. I would hope that I could reduce—yeah. We may be able to do better than that, I don’t know. I was kind of cautious with that. Number one, we’re not going to create problems for people. So let’s talk about marijuana, misdemeanor marijuana. Certainly, first-time offenders, we’re not going to even prosecute those. But if they come back, we’ll start doing assessments to figure out if there’s anything going on health-wise. Maybe there’s some other substance, maybe it’s alcohol, maybe it’s heroin, maybe it’s meth. A person could be caught with marijuana but have a meth addiction, they just didn’t have it on them at the time. So obviously, you would want to refer those people to some type of treatment service. If we solve the meth problem, we solve life’s problems for them. You likely will get a person who can hold a job, who can get back with their family—they’ve probably lost them because of the addiction. You put a healthy person back into the community. What’s your view on how the DA elections went across the country these midterms? There were big wins for progressive candidates not only in Dallas County but in Boston and elsewhere. What does that say about how the public is thinking on these topics? An interesting thing: back in the early ‘90s, we had—and I was a member of it—the Texas Punishment Standards Commission. It’s when we rewrote laws in the penal code and the code of criminal procedure. But we commissioned a study by the University of Texas LBJ School of Government. It was a statewide survey of individuals, and I don’t think it was by party or anything. What would you prefer to do—treat someone or lock them up? The overwhelming majority said treatment as opposed to prison. Even recent studies of Republicans—people who vote Republican all the time—when given a similar question, over 70 percent say treatment instead of prison. You add in Democrats, and they start getting into the 80s. It’s really an issue that crosses lines. It’s a common sense issue. I think that America, by and large, has come to accept the fact that marijuana is not a dangerous drug and Marijuana is not a gateway drug. We’ve learned that the gateway drug is alcohol. Then you have all these baby boomers. I’ve seen a study—I don’t remember who did it—but they tried to figure out who’s smoking marijuana. It’s mostly the parents. (laughs) Not the kids. I didn’t know that one. That was interesting. Sixties, ’70s. They’re the ones smoking the marijuana. I don’t know about you, but you probably have friends that smoke marijuana. And you know, so what? They’re not harming anybody. They’re not committing a crime because they’re smoking marijuana. If anything, they’re getting hungry and eating. It kind of begs the question: Why are we doing the same thing over and over, criminalizing marijuana and exposing young people—mostly—to a criminal conviction. Same thing with homelessness. We’re prosecuting homeless people on simple criminal trespass. Why are we doing that? We’re giving them a few days in jail, 20 days, 30 days, 60 days, whatever. And they get out and they’re just as homeless. If they were getting any services, those have stopped and they have to get signed back up. It doesn’t make any sense. We’re spending tax dollars to accomplish nothing. The national reformers have become a big part of these DA races. You experienced that from both sides over the last year. Let’s start with the primary. How were you able to win the primary without the support of some of the national folks? Outworked them, plain and simple. I never took anything for granted about either one of these races. I started in the spring of 2017. We started knocking on doors and putting up signs and reaching out to voters in high democratic voting precincts. We did that all the way through. These national groups did that at the last minute. We’re prosecuting homeless people on simple criminal trespass. Why are we doing that? … They get out and they’re just as homeless. I didn’t go out and get any of them. No, actually not. I didn’t have anything to do with anybody going out. What we did was, we mailed to mail-in voters. We sent mail to them and they didn’t. My primary opponent (Elizabeth Frizell), to my knowledge, never knocked on a door. And I don’t know where her mail went, if she sent any. I think it was just an assumption that, ‘I’m going to win.’ Because the type of effort that we put out, I didn’t see it (from her). So you sent mailers to mail-in voters? “Vote for John Creuzot.” If anybody went out and did any talking to people and helping, assisting them, I don’t know anything about it. That was not a part of my campaign. Did you go specifically for the senior citizen population? Whoever does mail-in votes. I don’t know. I didn’t do that—my campaign manager. You know who does mail-in votes because they do mail-in votes. (Ed. note: Texans are eligible to vote by mail if they’re disabled, out of town during the voting period, in jail, or older than 64 years old.) We targeted mail-in voters. There was no trick about it. It was just good planning. Did you end up getting national money? Yes, I did. Through (George) Soros. And I got money through the Texas Organizing project and I don’t know where they got their money from, you’d have to go check with them. I don’t know where. I talked to another source who pointed to the fact that you previously were Republican, and said you saw the writing on the wall that it would be difficult to win DA in Dallas County as a Republican. In ’96, I ran as a Republican. Didn’t really have anything to do with the 2018 election. Ann Richards lost in ’94, and myself and other Democrats—they pushed me to run as a Republican. I didn’t really want to switch parties, but if you want to stay a judge, back then, and you want to continue the work that I was beginning to do and hoped to do, I needed to be on a bench to do it. I never ever had a Democratic opponent. All this back and forth talk about he was this and he was that. There was a recognition that I was doing progressive work and addressing, in my own way in the early days, mass incarceration. Nobody ever ran against me. And then in 2008, I ran as a Democrat and I had an opponent who made an issue of the fact that I switched parties, and I got 68 percent of the primary vote. At that point, did you have any future goal of being a DA? When did that idea take hold? I thought about it for 2014 and decided against it. Didn’t want to split up the party. I thought that Craig Watkins still had a lot of support in the Democratic Party and it would just be a big fight against one another, and I just didn’t want to do that. So, I opted not to run. Things changed, and I decided to run in 2018. One case you’ll be taking over is that of Botham Shem Jean, a very high profile case in which Amber Guyger has been charged with manslaughter. Is that enough? What’s your plan if and when you take over? My understanding is that case will be presented to a grand jury before the end of the year. [Ed. note: A grand jury began hearing the case today, November 26.] There may or may not be a case there. I have no idea what the grand jury would do. Well, then we’ll have to prosecute it. Would you reassess if it’s a higher charge than manslaughter? If all the evidence has been presented and there’s no additional evidence to present, my presumptive policy would be that a case would not be re-presented. So, if you don’t like the charge you get, do you just keep sending it to grand juries until you like the charge you get? Or if there’s additional evidence that the grand jury didn’t know that may weigh one way or the other, do you have a duty to present it to another grand jury and let them decide? Unless there’s new evidence, presumptively, I would not present another case to the grand jury just to get another charge. Potentially. I don’t know. I have to rely on media only, but I don’t understand from the facts—as I see them from what I’ve been given—why it’s a manslaughter charge. It could be that I look at it and I can see that. But right now I don’t see that. Let’s talk about the bail system. Much has been written about it, and there has been a lawsuit. How would you like to change things when it comes to the bail system? The current bail system is unconstitutional, I’m very clear about that. I think it should be changed to a risk-based system. If you decline to prosecute low-level, non-human-being-threatening type cases such as criminal trespass and low levels of marijuana, that would eliminate the issue for those cases. For everybody else, it becomes should there be a bond or not? We are in the beginning stages across the United States in establishing risk factors. They measure risk to show up to court, risk to commit another offense, or risk to commit a violent offense. That’s one type of risk instrument; I’m not familiar with all of them. How much influence do you have on deciding how it works? A lot. I don’t know why, but our current DA actually fought the lawsuit and asked for it to be dismissed. I would not have done that. Now, and I take her at her word, she also says they were negotiating about it. But still, I never would’ve filed an answer in opposition to the lawsuit. We would’ve moved along a lot faster than we have without that answer. After the ruling on Sept. 20, a judge gave 30 days to put in a new system. They’re working on it now. In fact, somebody just called me the other day and they’ve hired some prosecutors, new prosecutors, and maybe hired some new public defenders. They’re working very diligently on it. They’re having weekly meetings on it, and if the DA’s office doesn’t mind, I think I’ll start attending those meeting to get a head start on it. The current bail system is unconstitutional, I’m very clear about that. I think it should be changed to a risk-based system. Have you had contact with Faith Johnson? We met last week. We’ve communicated a little bit back and forth. I’ve got to do some things, administrative things, get my picture taken, finger print, blah blah blah, get a card. And then we’ve talked a little bit about these cases. Not much. I want to be respectful of her and the fact they’re her cases and not really for me to weigh in on. She touted her record of prosecuting police officers. Roy Oliver got 15 years. Do you feel that that represents justice in that case? My first reaction is no. I wasn’t there. I didn’t hear the case. I didn’t see all the facts. But if you think about shooting an innocent 15-year-old in the head, then you say the car was moving toward you and threatening you and it turns out that that’s just not true. And we find out that you’ve pulled a gun on another family some time shortly before that. If you put if all together, 15 years is a pretty light sentence for that. That’s my first impression. Let’s hope not. Let’s hope that they stop shooting people. I mean, really. I think that’s what everybody wants. I think even they want it. I don’t know why shooting somebody is the first resort under a lot of these circumstances, but that seems to be the way it is right now. What’s your role in turning things around? Well, they need to be held accountable. If they’ve committed a criminal act, they need to be prosecuted like anybody else. I don’t think they should get any special favoritism. Do you see Amber Guyger along the same lines? She was off duty. Was she acting as a police officer? I don’t know. I don’t know enough about it to know the answer to that. I know that had he shot her, he wouldn’t have been given three days (before he was arrested), and he would not have turned himself into Kaufman County, and he would not, likely, be charged with manslaughter. I bet you that. So, in a sense, I think that perhaps there was special treatment given to her. When you were trying cases as a young lawyer right out of law school, under Henry Wade, did you ever envision running as a DA decades later on a platform that’s so different than the DAs of that era? No way. You couldn’t have foreseen it. People back in my day, it was standard practice for somebody who was on a felony probation, if they got caught for marijuana, it wasn’t uncommon for them to get a two-year sentence in a penitentiary. That’s why we loaded up the penitentiaries with silly stuff. Of course, any amount of cocaine was a second degree felony, two to twenty. Now, less than a gram is a state jail felony with an automatic probation the first time unless the judge has a specific reason to opt out of it. We have almost mandatory risk assessments and drug and alcohol assessments. None of that existed back then.